Depending on the severity of the damage, the process of returning to normal may take some time, due to rebuilding of infrastruture, and resuming water and power services. Ensure that animals continue to have access to adequate shelter, food and water, and that they are not exposed to any hazards. Locate and capture stranded/strayed animals. Verify if animals have injuries or exposure to chemicals that require veterinary assistance. Monitor the behaviour of animals to identify any issues as a result of the emergency such as smoke inhalation, food or water poisoning. Seek veterinary advice or evaluation if you have concerns about animals being exposed to diseases as a result of the emergency. In case of deaths after an emergency, post-mortems may be required to identify potential threats to other animals. If animals are in new surroundings, ensure they are calm before leaving them. Frightened animals can become aggressive and may harm themselves or injure another animals. Rebuild infrastructure to house animals, even if temporary. 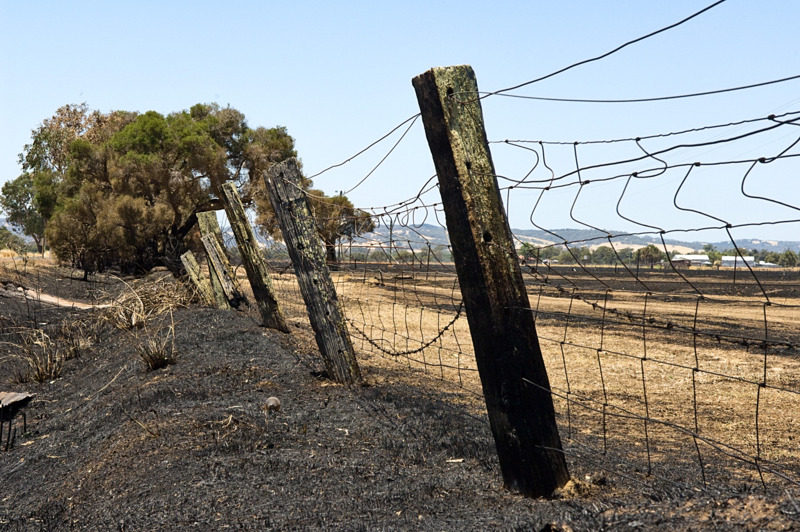 Particular attention should be given to repairs to fencing and quarantine areas. Areas exposed to chemicals need to be cleaned. Electricity and water supply should be re-established as soon as possible, particularly in buildings housing large numbers of animals and/or during extreme weather conditions. Food sources and distribution should be secured. Removal and disposal of carcasses is important to prevent diseases and contamination of water sources. Revegetation should occur to provide shelter to farm animals and wildlife. If required, identify new areas to move livestock to. Verify new living areas are sanitised, disinfected and free of contaminants. Make sure accommodation is undamaged, clean and free of debris. Animals that have been affected by a natural disaster may be traumatised and easily frightened. Animals should be moved once property repairs have been completed. Animals returning to properties must have adequate shade to shelter from the weather.